MILAN – In the increasingly competitive Ho.Re.Ca. sector, locations are looking for drinks with a competitive advantage, in line with changing drinking styles. This includes greater health consciousness, allergen-free ingredients, absence of oxygenated fats and palm oil, all without forgoing a gratifying choice and a pamper break. To cater to this need, Gruppo Gimoka has developed Pure Evasioni, the new multibeverage range in capsules, which are extremely practical to use, thanks to the all-in-One GM1 machine. Designed specifically for the professional market, Pure Evasioni offers a unique variety of top-quality drinks, thus enriching the beverage offer with an eye to modern lifestyle trends. Contemporary tastes that blend aromas from all over the world in new, surprising sensory profiles, combining healthy and functional effects with innovative and sophisticated tastes. A rich assortment of drinks made using several extraction processes – hot beverages, infusions, teas, drip coffee and Americano – all having the same high-quality ingredients. Functional ingredients, such as turmeric or ginger, for instance, use the actual powders of the product instead of the mere aromas, which enhance both the fragrance of the drink and its benefits for drinkers’ health. Another important feature is the great attention paid to possible intolerances, which has led to several “free-from …” formulations. 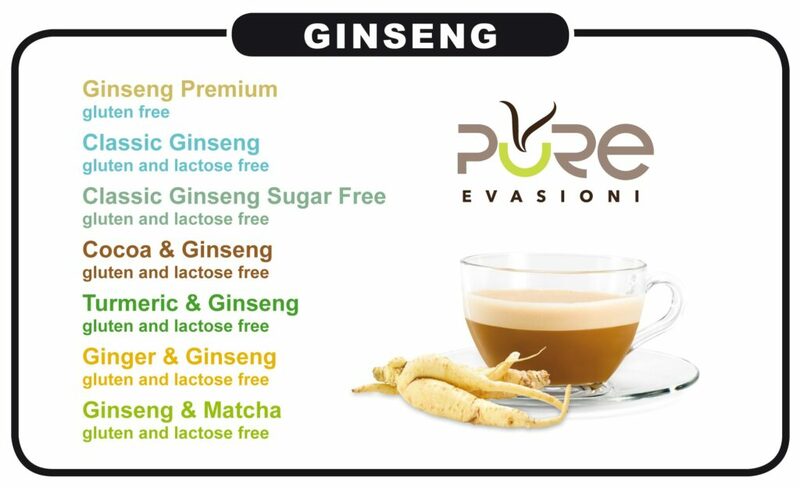 The ginseng menu offers a wide variety of drinks – ranging from Ginseng Premium, to Ginseng Classico – which encloses all the aromatic and invigorating properties of this root, although without lactose, and is now available also in the no sugar version. We then move on to tasty pairings: Cocoa & Ginseng, Tumeric & Ginseng, Ginger & Ginseng, up to flavoursome Ginseng & Matcha, which enhances the restorative qualities of the fine antioxidant- and polyphenol-rich Japanese green tea matcha (in powder form). The focus for trendier consumers is on Unicorn Milk, an “amazing” health-giving beverage thanks to its extract of spirulina, which together with ginger features antioxidant and anti-inflammatory properties. The following are also a must: Ginger & Lemon, a combination of the intense aromas of ginger and thirst-quenching lemon, and Golden Milk, a tasty, velvety milk- and turmeric-based drink which is known for its innumerable beneficial and ayurvedic properties, completed with brown sugar and coconut flesh. However, a wide range of beverages are suitable for more traditional tastes, like the classic Barley Coffee, with its excellent digestive, antioxidant and anti-inflammatory properties. 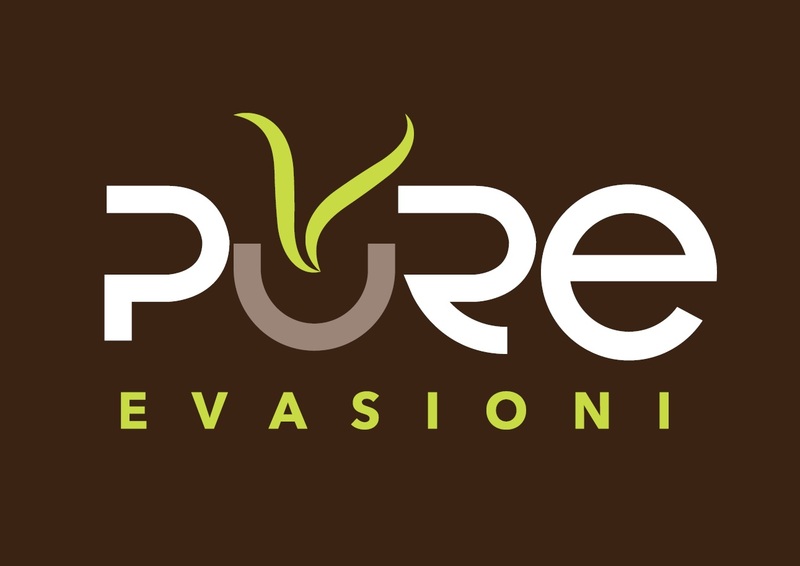 Pure Evasioni also includes a broad selection of leaf and herb teas. Besides English Breakfast, the long-time favourite and perfect tea to wake up with, there are also: the well-loved and refreshing Green Tea, obtained thanks to a skilful blend of leaves that are harvested while very young when they have not yet been oxidised, or Earl Grey, with its unmistakable bergamot aroma. The excellent Red Fruits tea is a mixture of fruit, red berries and herbs, which lend a marvellous concentration of aromas and properties, while Chamomile Mix reinterprets relaxation in a modern key by combining the properties of Camomile flowers with the refreshing flavour of mint leaves. The beverages in the Pure Evasioni range are part of a package that is offered with the Gruppo Gimoka all-in-One GM1, a patented technology that allows you to use two different types of capsules in the same machine, in order to brew consistently top-quality drinks with different brewing procedures: Gimoka multibeverage capsules for espresso, café crème, Americano, Turkish coffee and instant beverages – requiring high pressure – and Keurig® (K-cup®) compatible capsules* for drip coffee and leaf teas, which instead require low pressures and different infusion times and temperatures. The broad choice, innovative formulations and quality ingredients of the Pure Evasioni range, coupled with the all-in-One GM1, featuring a compact design and outstanding ease of use and maintenance, allows locations to extend their offer to cater to new tastes, by containing investments and limiting the use of space and resources, thanks to the use of a technologically advanced single machine. Established at the beginning of the 1980s, thanks to the insight of its founder Ivan Padelli, Gruppo Gimoka has quickly become one of the most renowned coffee roasting companies in Italy, in terms of processed green coffee. The Group controls the entire value chain: from raw material supplies to carrying out the delicate roasting and grinding phases, followed by packaging and encapsulation. The core business is divided into two business units: a ground and grain coffee unit and a single-pack unit. Thus, the company has developed specific skills, both in terms of technology and manufacturing quality, and it is now a privileged partner in developing private label projects with leading international firms. Thanks to the know-how it has acquired over the years and large, ongoing investments in its industrial and distribution segments, Gruppo Gimoka is present in the Professional sector (Ho.Re.Ca., OCS and Vending) and home sector, with its own brand and through private Italian and international brands.